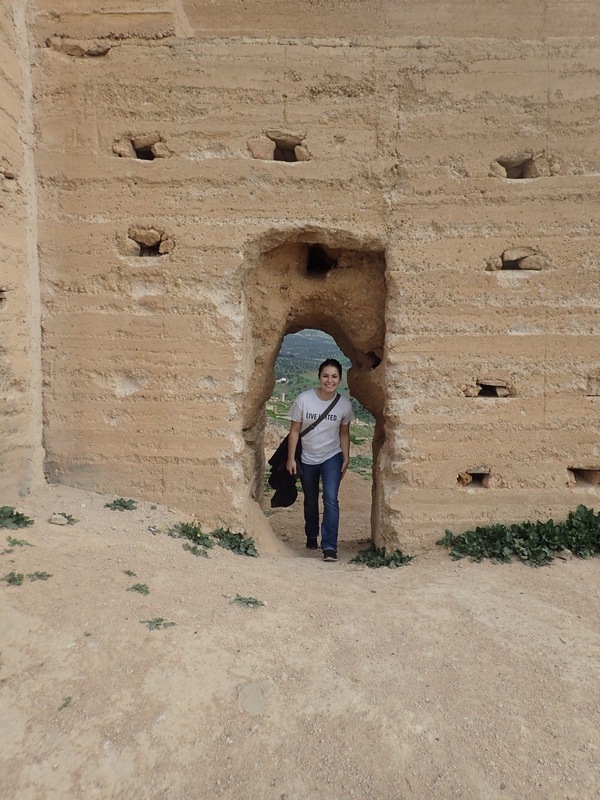 If I were to do justice to a description of our initial introduction into Fez, Morocco after a mid-day landing, you and I would both be here for years as I burst forth with written feelings of love and respect for this beautiful, beautiful community of passionate Moroccans. 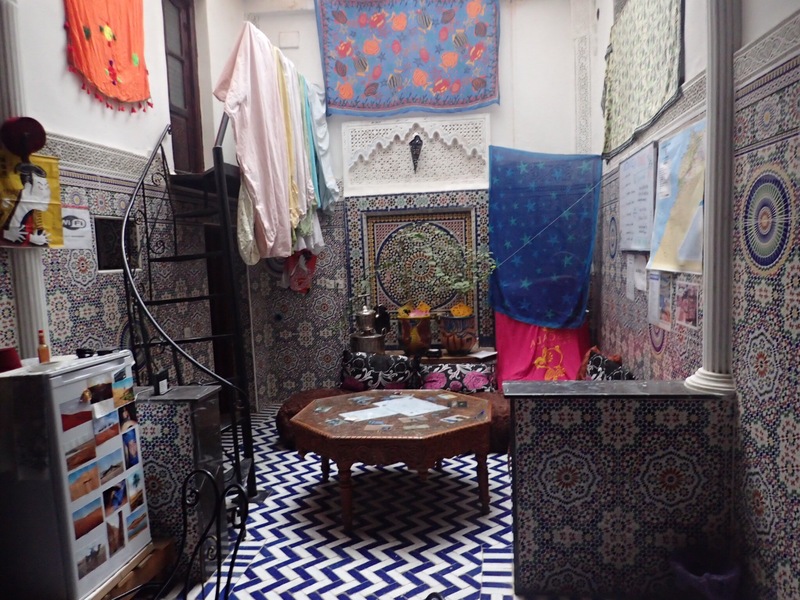 I am going to quell my temptation to describe our beautiful hostel; the magical Germans, Americans, Canadians, Moroccans, Moroccan-Americans that we have met and fallen in love with and shared Moroccan tea with and curled up on blanketed cushions against tiled walls lit on fire by the Moroccan sunlight streaming in from the skylight. I didn’t quell very well. He begins our time all together with a huge freckled smile and peace radiating through his big brown eyes, telling us his philosophy of love and respect and community and grounding. Why he loves people and why he has been leading people through the Medina for the past 33 years. The roasting bread, fresh dates, springy rosemary and avocados, freshly squeezed orange juice; the smell of weaving wool and tanning hides and the earthy smell of chickens clucking around. Cats would duck in and around your feet, dancing alongside you as you jaunt through along the 12th century cobblestones. 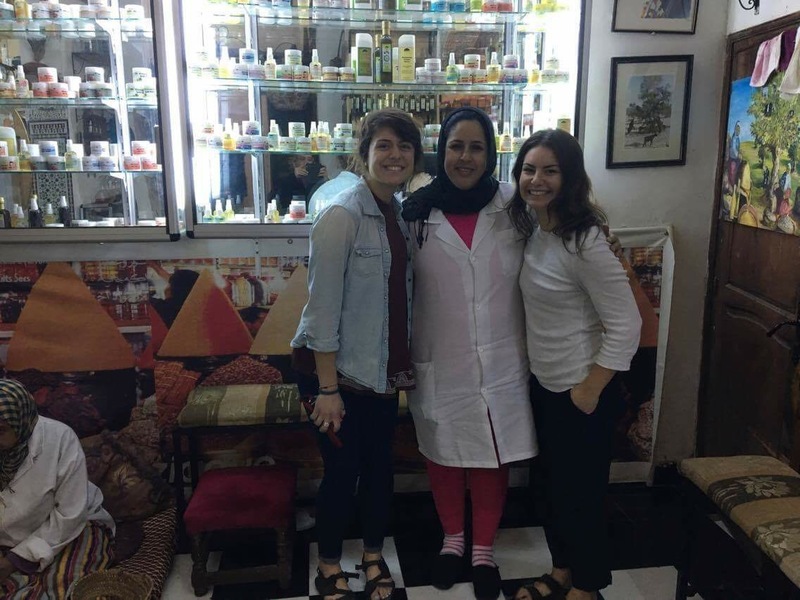 Our beautiful guide knew everybody; we found ourselves meeting parakeet vendors and tanners and saying hi to shop owners. Passing by the world’s oldest library (857) and the oldest University casually, stroking the smooth intricate tiles that lined the walls of the Medina. It would be a post on its own to describe the Medina in adequate detail and the people that we were so fortunate to meet. 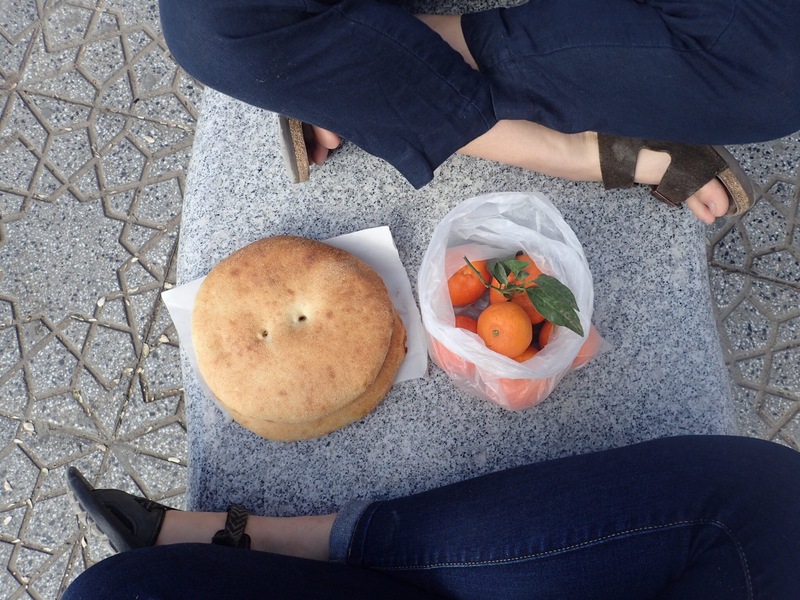 Katie and I made a reluctant farewell to our guide and grabbed loaves of freshly baked bread and oranges for a sunny picnic and people-watching on the streets of Fez. After spending a magical 2 hours or so reclining on the couch cushions in the hostel, listening to Cat Stevens and chatting about adventures with our other backpacker pals, we take back to the streets with a magnanimously glorious Berlin chick. 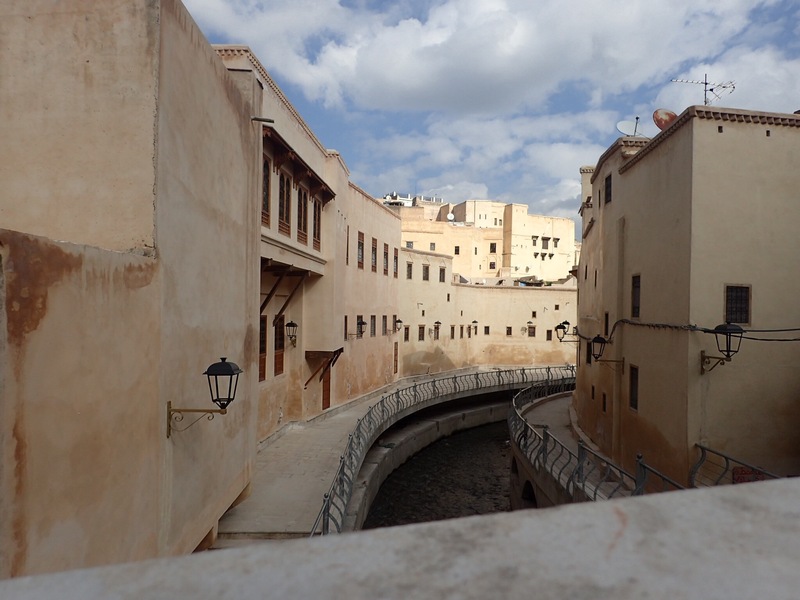 We jaunt to the bus station and back, weaving through hoards of sweatpants-clad young males hollaring, “You need husband?” And found our way back into the depths of the Medina, meeting up with a jovial American couple. A cafe geared towards backpackers and cross-cultural communities–Cafe Clock–was hosting a cinema night in the labyrinth of their own cafe; the five of us climbed tiled steps and clung to iron railings and picked our way into a high-ceilinged sandstone room with theatre chairs. We ordered fresh fruit smoothies, espresso, milkshakes and lattes and snuggled into together in the tiny cozy room to a projection of The Eternal Sunshine of the Spotless Mind with French subtitles. Absolute bliss after an entire day spent meandering amongst dusty throngs of bustling merchants and customers. After the movie, we sauntered upstairs to the rooftop terrace and perched ourselves on thick cushioned benches, breathing in the cool night air and talking for a good three hours about everything from previous adventures to life in our own cultures to Trump and politics. Around 10:30 or so we pick our way back to the hostel, stopping by a little shop to purchase a late dinner of bread, ramen noodles and pringles. We end up running into a jolly Swiss man buying cigarettes, and spend a good half hour talking with him about his three weeks in Morocco. We go back to the hostel and sit around the table together, sharing our late-night hodgepodge of a meal and watching YouTube videos of German political comedians, and overall just basking in a really spot-on day. 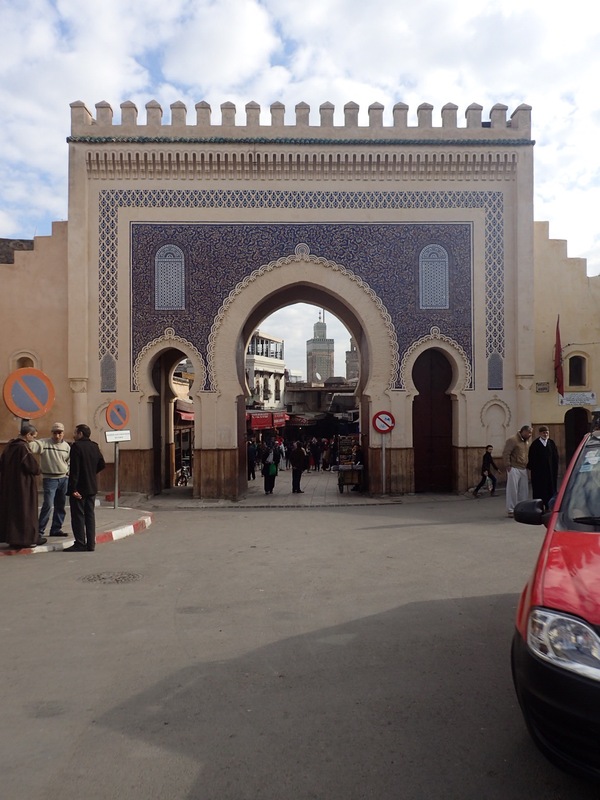 Katie and I slept in a smidge and found ourselves tucking back into the Medina to buy bananas and crumpets for breakfast the next morning around 10. 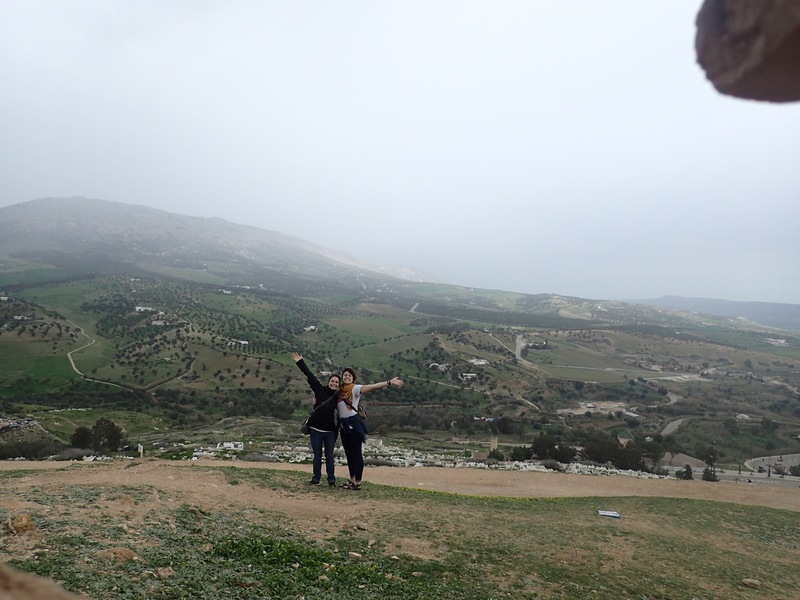 We then took ourselves on a dance up to the ruins lining the walls of Fez, breathing in the surrounding Mountain landscapes and resting in the out-of-city air. Whilest having a date-pit-spitting contest, we reflected on what’s so glorious about Fez and the little bit of Morocco that we have been exposed to. There’s such a wonderful tradition and culture of rest. So many people sitting outside of cafes, sipping mint tea and sharing meals together, sitting in the squares in blanketed lawn chairs, resting together. It’s not in a lazy way, there’s not an aroua of laziness. 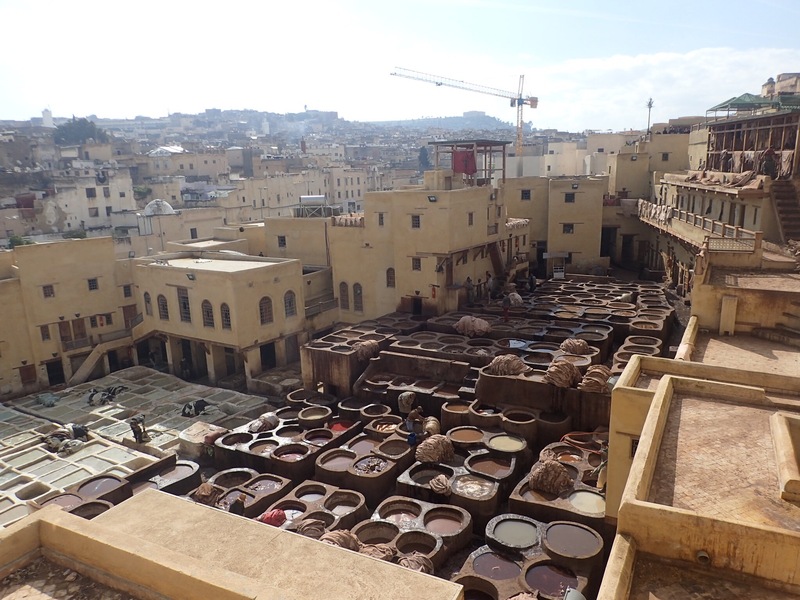 One can tell that the people of Fez work very hard, but moreso that they are truly passionate about what they do. The weaver that we met was the fourth generation weaver in his family to work in this beautiful inner-Medina shop. The perfumer and argan oil maker was a miraculous woman who taught herself essential oils and let herself love the feeling of beauty that came from the high quality argon oil. Our guide himself could see himself doing nothing more enjoyable than taking his “daughters” through the Medina and sharing community. There’s mindfulness. And respect. And pride over one’s culture, but actual, well-founded pride. Pride not based on meaningless things like borders, but on a cultivated community. Katie and I book our hostel in Marrakech and rest for an hour or so in the glorious afternoon lazy breeze. We take back to the streets, arm ourselves with special soap, hair clay, and a scrubbing glove and hit the Hamman. It’s a bit…abrupt…to walk into a place where suddenly a lot of naked members of your same gender are seated cross legged on the tiled floor, deligiently scrubbing the skin off their respective bodies in the foggy sauna-esque dome. The air is thick and humid and perfumed with the fragrance of cleanliness, and suddenly, in the aroma of tradition and absolute lack of self consciousness, any feelings of awkwardness merge with the hot steamy water down the drain. After a surly hour and a half scrub, we find ourselves suprisingly really drained of energy. 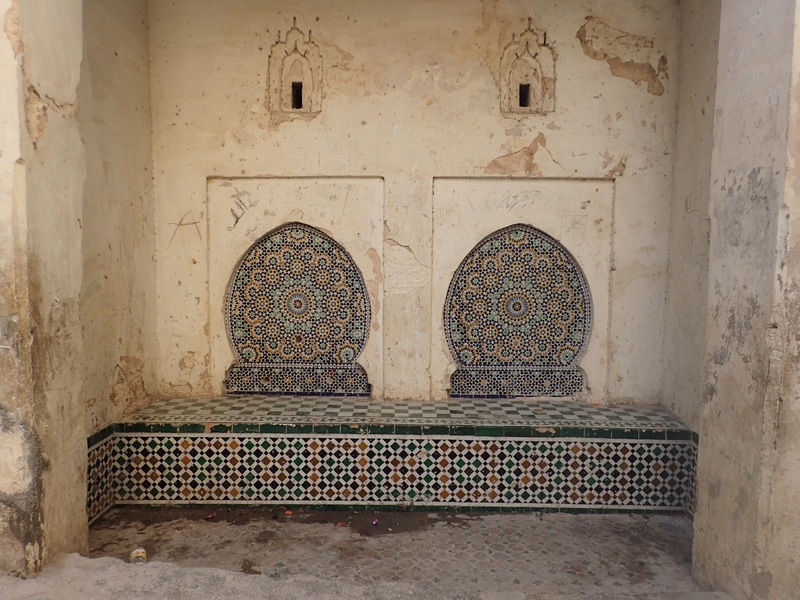 We saunter out of the steamy building and grab a beautiful cup of freshly squeezed orange juice, gulping down the sweet, Moroccan pulp and feeling on top of the world from the cleanliness and the peacefulness of the Hamman. After forcing ourselves to march zombie-like to the bus station in order to purchase our tickets for the next day, we head back to our hostel and curl up under the blankets with a hearty potato sandwhich-compliments of Back Home Fez–and a viewing of Indiana Jones and the Lost Ark, both of us dosing to sleep around 9:30. Fez is magic. Truly, truly Moroccan magic. I hope to someday return and get to know it better; I know we merely scratched a surface of it’s enormous, untapped beauty.